Laptops are great mobile devices to carry around with you and get things done on the go. However, when it comes to playing demanding games, unless you have a top-end notebook you probably won’t end up with satisfactory frame rates. As a result multiple companies have looked towards providing laptop users with an external option that enables them to game comfortably. One such endeavor was Shuttle’s GXT external graphics card solution. First debuted back at CeBIT 2010, the external cards would hook up to compatible netbooks via a specialized GXT port. According to Shuttle, the external card was capable of boosting benchmarks from a 500 score in 3DMark06 to a score of 5,000 (using their HD4650 and a Shuttle netbook). And while we would have loved to see this device hit the markets, Shuttle appears to have cancelled it altogether. According to Netbooknews.com, the GXT development has been cancelled completely and the R&D department responsible for it has been merged with other departments. According to the Shuttle representative at CeBIT 2011, the company had to slash its expenditure costs and the GXT project was a casualty of that. While we were hoping to be able to test one of these products in the future, we’re going to have to make do with our onboard GPU from now on. 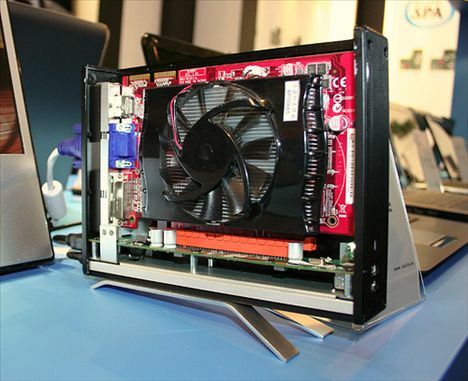 However, users interested in hooking up an external graphics card can look towards certain do-it-yourself projects out there that connect through the express card slot on your notebook. Or you can go ahead and try Villagetronic’s ViDock that comes readymade and also connects through the express card slot.